『 Mr.&Mrs. スミス　(2005) MR. AND MRS. SMITH 』、『 Ｍ：ｉ：ＩＩＩ　(2006) MISSION: IMPOSSIBLE III / M:I:III 』を超え、全米オープニング歴代新記録樹立!! 【ボーン・アルティメイタム 第05段落】　Former CIA covert operative Jason Bourne (Matt Damon) eludes Moscow police and goes into hiding after being shot by Russian F.S.B. agent Kirill (in The Bourne Supremacy). 【ボーン・アルティメイタム 第06段落】　Six weeks later, The Guardian correspondent Simon Ross (Paddy Considine) meets with a source to discuss Bourne and Operation Treadstone. The CIA begin tracking Ross when he mentions "Operation Blackbriar" on a cell phone call to his editor. 【ボーン・アルティメイタム 第07段落】　Bourne travels to Paris to inform Marie's brother, Martin (Daniel Bruhl), of her death and assures him he's hunting her killers. 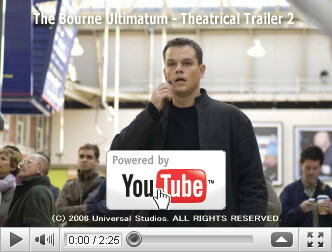 【ボーン・アルティメイタム 第08段落】　In London, Bourne meets with Ross at Waterloo Station after learning of Ross' investigation of Treadstone. When Bourne realizes that the CIA is tracking Ross, he helps him evade capture, but Ross deviates from Bourne's instructions and is killed by Blackbriar "asset" (assassin) Paz (Edgar Ramirez) on orders from Blackbriar's director Noah Vosen (David Strathairn). 【ボーン・アルティメイタム 第09段落】　CIA Director Ezra Kramer (Scott Glenn) sends Pamela Landy (Joan Allen), who unsuccessfully hunted Bourne six weeks earlier, to help Vosen after he spots Bourne in a CCTV camera feed. After searching Ross' notes, they deduce that his source was Neal Daniels (Colin Stinton), CIA Station Chief in Madrid, who was formerly involved in Treadstone and is actively involved in Blackbriar. 【ボーン・アルティメイタム 第10段落】　Bourne, having taken Ross' bag after he was killed, is led to Daniels' Madrid office but finds it empty. Nicky Parsons (Julia Stiles), a former Treadstone support technician, arrives shortly after Bourne incapacitates the CIA field team sent by Vosen and Landy to capture him. She decides to help Bourne escape another incoming CIA squad and tells him Daniels fled to Tangiers. It's implied that Parsons and Bourne had a deep, possibly romantic relationship before he lost his memory. 【ボーン・アルティメイタム 第11段落】　Upon arriving in Tangiers, Parsons hacks into the CIA database to locate Daniels but fails, finding that Blackbriar asset Desh Bouksani (Joey Ansah) has been tasked with killing him. Vosen learns of Parsons' log-in attempt and orders Desh to kill her as well as Bourne, a decision Landy disagrees with. Afterwards, Vosen calls Kramer and confirms their intentions to use Landy as the scapegoat if things go wrong. 【ボーン・アルティメイタム 第12段落】　Bourne tails Desh to Daniels but fails to prevent Daniels' death by a roadside bomb. He does, however, protect Parsons by strangling Desh after an intense hand-to-hand fight and later sends her into hiding. Upon examining the contents of Daniels' charred briefcase, Bourne finds the address of the deep cover CIA bureau in New York City where Vosen directs Blackbriar. 【ボーン・アルティメイタム 第13段落】　Bourne travels to New York; Landy receives a phone call (in a repetition of the final scene of The Bourne Supremacy) which is revealed to be tapped by Vosen. Landy thanks Bourne for the tape he sent her which revealed the corrupt dealings of former Treadstone director Ward Abbott, and also provides him that his real name is David Webb and his birthdate is 4/15/71. 【ボーン・アルティメイタム 第14段落】　While speaking with Landy, Bourne notices Vosen storing highly classified materials in a safe in his office. Bourne tells Landy to "get some rest" because she "looks tired", which she and Vosen both understand to mean that he's currently surveilling her. 【ボーン・アルティメイタム 第15段落】　Vosen then intercepts a text message sent to Landy from Bourne advising a location for a meet and leaves his office with a team to follow her. Bourne breaks into Vosen's office and steals classified Blackbriar documents and Vosen sends Paz after him, resulting in a car chase which ends with Paz forcing Bourne's stolen police car into a concrete divider. 【ボーン・アルティメイタム 第16段落】　Bourne gets out and holds Paz at gunpoint before sparing his life and continuing on to 415 East 71st Street, memories of which were triggered by the false birthday he was given by Landy. Vosen also figures out Landy's code and warns Dr. Albert Hirsch (Albert Finney), who ran Treadstone's behavior modification program, that Bourne is en route. 【ボーン・アルティメイタム 第17段落ネタバレ】　Landy meets Bourne outside the building and admits to her change of heart; that she's helping him because she hadn't signed up for programs like Treadstone and Blackbriar. Bourne gives her the Blackbriar files before going inside and Landy faxes them to a secondary witness with Vosen arriving just as the last page is successfully sent. 【ボーン・アルティメイタム 第18段落ネタバレ】　Bourne meets with Hirsch in an upper level room and, with Hirsch's help, finally recollects that he was not forced into the program, but in fact volunteered. He proclaims to no longer be "Jason Bourne" and flees from Vosen's pursuing team to the roof. 【ボーン・アルティメイタム 第19段落ネタバレ】　There, Paz confronts Bourne with why he didn't kill him when he had the chance. Bourne questions Paz as to his motives and repeats the dying words of "The Professor", a Treadstone assassin he killed years earlier (in The Bourne Identity): "Look at us... Look at what they make you give." Paz lowers his gun as Bourne runs to jump off the roof, but Vosen appears and shoots at Bourne as he leaps into the East River below. 【ボーン・アルティメイタム 第20段落ネタバレ】　Some time later, Landy is shown testifying before the Senate regarding Blackbriar. Parsons watches a television news broadcast about the exposure of Operation Blackbriar, the arrests of Hirsch and Vosen, a criminal investigation against Kramer for authorizing the operation, and that David Webb, a.k.a. Jason Bourne, was reportedly shot and fell into the East River. 【ボーン・アルティメイタム 第21段落ネタバレ】　Upon hearing that his body has not been found after a three-day search, Parsons smiles; Bourne is shown swimming away underwater after his fall.